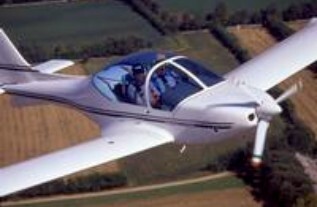 The Texan is a two seat ultra-light plane. As a true three-axis low wing aircraft, it has been designed to get maximum performance when compared to the more traditional aircraft designs. With its high aerodynamic efficiency the Texan is a master at short take-off and landing runs, rapid climbs and fast cruises with modest fuel consumptions. A unique feature of the Texan design is the elevated level of flight comfort for the pilot and passenger alike. With excellent views, extra cabin space and the very low noise level inside the cockpit, occupants can now enjoy comforts usually found only in commercial aircraft. Texan 600 LSA is a two seats, three-axis, low wing, designed to obtain very good performance, maximum comfort, excellent views, very low noise level inside the cabin, elevated standard of quality and construction compared to the traditional designs. 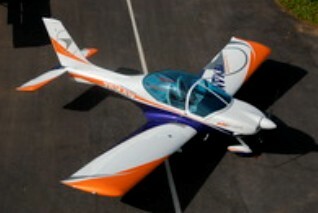 It has been designed for the new Light Sport Aircraft category. With its high aerodynamic efficiency the Texan is a master at short take-off and landing runs, rapid climbs and fast cruises with modest fuel consumptions. To strengthen the high value of this project, the aircraft is also very easy to fly, with perfect control even at low speed. Our engineers have designed the Texan to give the owner a durable and low maintenance plane for the life of the aircraft. When it comes to crash safety the Texan has a re-enforced structure ensuring the strongest possible fuselage. The windshield also has a roll over protection bar further increasing occupant safety. The wing is a rectangular type with laminar profile and separate flaps that work independently to the ailerons. Both flaps and ailerons are integrated into the profile of the wing. This configuration allows a wide range of low resistance control due to the wake of the airflow permitted by the use of both features. Each semi-wing is constructed using high tech composite materials. In fact the internal wing structure is made with carbon fiber resin and honeycomb sheets with the advantages being reliability, structural strength and lightness. Ailerons and flaps are fully composite type. The linkages and their relative hinges are fixed directly to the composite structure. Each aileron is hinged on a support fixed to the wing and the movement is directly braked and balanced by counterweights that also prevent flutter phenomena. Each wing is connected to the fuselage through particular anchorage points and the spars are linked with specially designed bolts. The wing is a “wet” type, with fuel tank integrated in the wing shells and with a capacity of 50 lt. of fuel each. The fuselage is integrally constructed in carbon fibers and honeycomb. Five ribs further strengthen the self-supporting structure guarantee the rigidity of the fuselage system. The tail boom is made in carbon fibers materials and it is an extension of the same structure of the fuselage. The front zone of the fuselage is delimited by a firewall made of steel and strong enough to accommodate the engine mounts and associated bolts. The cabin is closed by folding Plexiglas canopy. The Plexiglas thermoformed windshield has been fixed to the cell through screws and allows for very good visibility outside; it has been redesigned with a more aerodynamic shape. The fuselage support the landing gear system and it's special strengthened absorb vibrations, shocks and bumps that may be experienced during rough take off and landing. The two seats are made with composite matrix structure, fastened directly to the fuselage frame through screws. Each seat is adjustable and upholstered in a soft fabric material or optionally available in alcantara®. Both safety seat belts are securely fastened directly to the structure of the fuselage through bolts. The empennages are constructed entirely in composite materials to guarantee lightness and structural rigidity. The fin is an integral part of the tail boom and is opportunely fixed to the rudder section. Rudder movement is achieved via two metal hinges especially designed and fixed directly to the composite structure. The elevator is a complete extension of the whole surface type and is frontally attached to the stabiliser through an oscillating support that is rigidly connected to the tail boom. The elevator includes a trim on pitch axis that is directly adjustable from the cockpit (optional electric control servo) and that eliminates the need for an anti-tab function. To avoid flutter the elevator have been provided with balancing counterweights. A special lower fin is fitted in the lower part of fuselage boom. The landing gear system is a fixed tricycle type with pivoting forward gear. The main gear is composed by two legs of rectangular section made of aluminium alloy type 2024 T3 and fixed to the fusolage by two bolts . An additional metal structure connects each leg to the longitudinal rib of the fusolage. The front gear is pivoting type, free to rotate during take off , landing and ground manouvres and is composed by a beam of aluminium alloy type 2024 T3 which acts as a spring. The two wheels of the main gear are made by aluminium alloy of the separable split-rim type. Each wheel comes with sealed bearings and tires with air chamber. The brakes are the disk type with hydraulic command positioned in the pedals and acting on main gear wheels. The steering front wheel is achieved by the rudder pedals. The wheel is made by nylon separable split-rim type, with sealed bearings and tire with air chamber. To reduce drag, wheels and legs are covered with fiberglass fairings. The aircraft is governable around three axes by the ailerons, the elevators and the rudder. The cloche, through rigid aluminium push-pull rods, controls the ailerons and elevators. Ailerons is designed to guarantee the differential command using hinges with spherical terminal that synchronises the whole command mechanism, ensuring a low friction and precise movement. Stainless steel cables connected to the pedals control the rudder. The elevator is provided with an automatic anti-servo tab that can be controlled by the trim on the pitch axis. The flaps are situated in the nearest part of the wing root. These are operated through an electric servo actuator and it is also provided with an indicator, positioned on the instrument panel that shows the angle of deflection measured in degrees. Equipped with the powerful and appreciated Rotax 912 ULS, four cylinders, four stroke, reduction geared propeller with mixed air/water cooling system. The factory produced two versions of the Texan Top Class. 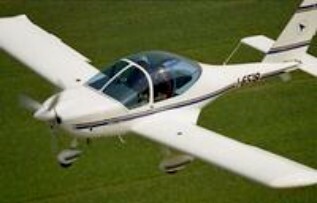 The Texan Top Class 600 LSA and Texan 550 LSA. The 550 being the MTOW. The 600C comes with a castoring nosewheel and toe brakes.